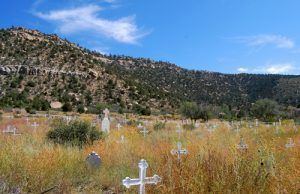 The many tragedies of Dawson, New Mexico are memorialized in this forgotten cemetery in Colfax County. In 1869, John Barkley Dawson came to the Vermejo Valley looking for a place to homestead. He found it 5 1/2 miles upstream from the settlement of Colfax and paid $3,700 to Lucien B. Maxwell for the deed, finalizing the verbal deal with a handshake. After settling on his land, Dawson found coal on his property. Scraping chunks of coal from the surface of his farm land, he burned it in his stove rather than using wood. At first, his neighbors thought he was a little crazy, but out of curiosity, several asked for samples and were pleased at the results, so much so that Dawson began to sell the coal to his neighbors. In 1870 Lucien B. Maxwell sold his interest in the Maxwell Land Grant. The property was quickly sold two more times over the next two years and in 1872 it was in the hands of a Dutch Firm who was aggressively looking for ways to exploit the resources of the grant. The grant owners immediately attempted to extract rents from many of the squatters living on the grant; however, they often had no way of knowing who was a legal owner and who was not. When they found out that the Dawson land was heavily laced with coal, they wanted to develop the vein and attempted to evict Dawson. 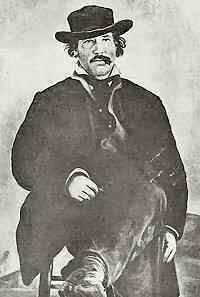 Dawson was ready to fight ready to settle the matter with six-guns, but later he consented to settling the matter in the courts. Dawson admitted that his transaction with Maxwell in 1869 was purely verbal; stating that a promise and a handshake was the way Maxwell had always done business. Dawson hired an attorney and the case was tried in the fall of 1893 favoring Dawson in their decision. The court held that the Land Grant Company could not prove that Dawson did not own the land and the mineral rights. And, much to the Land Grant Company’s chagrin, the courts further found that Dawson had not bought the 1,000 acres that he had thought, but rather 20,000 acres. Dawson and his partner, Charles Springer, ranched the land until 1901, when he sold most of the property to the Dawson Fuel Company for $400,000. He retained 1200 acres for himself and continued to ranch. The Dawson Fuel Co. was founded with the help of Charles B. Eddy of El Paso, Texas, a railroad promoter. A 137-mile-long railroad was built from the mine to Tucumcari, New Mexico linking the spot with the Rock Island Lines. By August 1, 1901, a crew of fifty miners was ready to work. A sawmill was busy turning out lumber for houses, coke ovens were smoking and by the end of that first year, Dawson was well on the way to becoming a city and the center of the largest coal mining operation in New Mexico. Later, the company built a hundred cottages for 500 more people and erected additional coke ovens. Off to a quick start, the town was prosperous and growing. Tragedy struck the first of many blows to the new community on September 14, 1903 when fire broke out in the No. 1 Mine, followed by several explosions. With the grace of God, 500 miners escaped. The men worked for a week to control the fire and when it was over three were dead. 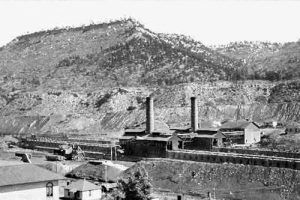 By 1905, 124 coke ovens were belching fire and the town was thriving with about 2000 residents. By this time the settlement boasted a post office, a liquor store, a mercantile, a school, a newspaper and a large hotel. 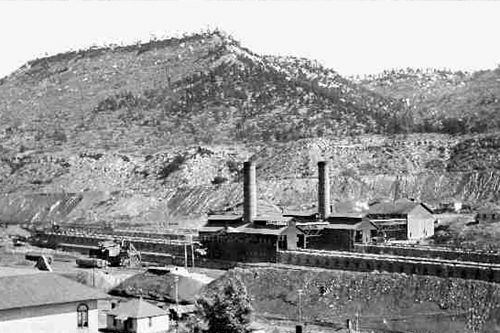 In 1906 the Phelps Dodge Corporation bought the Dawson mines and, sparing no expense, determined to make Dawson a model city and the ideal company town. The company built spacious homes for its miners, supplied with water from the company’s water system. They also built a four-story brick building which housed the Phelps Dodge Mercantile Department Store which sold virtually anything the townsfolk might need — food, clothing, shoes, hardware, furniture, drugs, jewelry, baked goods and ice from its own plant. A modern hospital was built which maintained a staff of five doctors and was complete with a laboratory, surgery and x-ray equipment. For their leisure time, the miners enjoyed the use of the company built movie theater, swimming pool, bowling alley, baseball park, pool hall, golf course, lodge hall, and even an opera house. Phelps Dodge also supported two churches, one Catholic and one Protestant. Children attended either the Central Elementary School in downtown Dawson or the Douglas Elementary School on Capitan Hill. A large high school building was built that eventually employed 40 teachers and their athletic teams won many state championships. The company also built a steam-powered electric plant, which powered not only Dawson, but also the nearby towns of Walsenburg, Colorado, and Raton. Providing good-paying jobs for the residents, the extra features of the company town helped keep the employment stable and under the new management Dawson’s population grew quickly to 3,500. The residents were well aware that mining was a dangerous business — the best of coal mines being squalid, hot, dark holes permeated with black dust. Even if the miners escaped the constant dangers of cave-ins and explosions, their life expectancy was sharply reduced by “black lung” and other affects of the sooty mine air. From time to time a miner would fall into a pit or die in the collapse of a seam, and the company built cemetery slowly began to fill. Dawson became a mecca for miners from all over the world with immigrants arriving from Italy, China, Poland, Germany, Greece, Britain, Finland, Sweden, and Mexico. 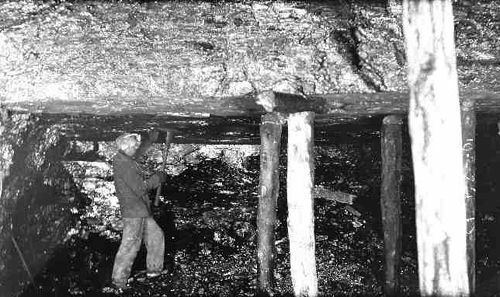 The miners worked together to dig the coal that fueled an area equal to 1/6 of the United States and Dawson grew into a company town of about 9,000. Yet, Dawson was doomed to suffer a series of tragedies that shadowed its history to the end. During this period of abundance and prosperity Dawson suffered its worst catastrophe on Wednesday, October 22, 1913, only two days after the mine’s inspection. The morning dawned bright and clear and 284 miners reported to work at Stag Canyon Mine No. 2. Work went on as usual until a little after three p.m. when the mine was rocked by a huge explosion that sent a tongue of fire 100 feet out of the tunnel mouth shaking the homes in Dawson two miles away. Tragic, very tragic history. Thank you for posting this. Thank you for the education.